The new kid on the block has some facts you may, or may not know about him. The newest signature athlete in the Nike family, Kyrie Irving, is relatively new to main stream media. His media coverage in high school wasn’t anywhere near what its was for the Black Mamba, and King James, and he was injured for most of his college career unlike Kevin Durant. But Nike gives us some insight into the man behind the Kyrie 1 with 10 facts you don’t know about #2. #1 – Irving could dribble a basketball at 13 months. Irving demonstrated ball control as a toddler and could routinely make a basket in a regulation-height hoop at age 4. By 6, he could sink a left-handed lay-up. #2 – He flourished in high school. Irving always stood out as an athlete but high school is when his star power started to shine through. He transferred schools in New Jersey for his junior and senior years and was surrounded by other seriously talented players. He put in countless hours, studied film, embraced his skills and — in the ultimate test — finally beat his dad 1-on-1. #3 – Irving Played Baseball and was an avid skateboarder. In addition to basketball, Irving played baseball, holding his own as a shortstop with older boys when he was just seven and eight. He was also an avid skateboarder as a teen. *WearTesters note: who wants to see Kyrie skateboard current day? I do! #4 – Irving’s Godfather is former professional basketball player Rod Strickland. Irving’s connection to Nike began when he was still in a crib. His godfather Rod Strickland was a Nike athlete who made sure his godson was outfitted in Nike shoes. Irving signed on with the Swoosh in 2011. #5 – Irving keeps a journal. Irving enjoys writing and has always kept a journal, where he enters quotes and mottos to help guide his life and his game. The “Hungry and Humble” motto featured on the new KYRIE 1 is a maxim shared by father and son that Irving once printed in silver ink on his black-and-white Nike duffle bag in grade school. #6 – Setting goals is the key. The secret of Irving’s success may lie in goal-setting and discipline. “We always had goals for ourselves and he had to learn how to manage his time from a young age,” Drederick Irving says. There was basketball practice afterschool followed by homework and chores at night. “Cs weren’t accepted in our house and good grades were always a point of pride for Kyrie.” He still lives by goals, writing them on the wall at home. #7 – Plastic bags did wonders for Irving’s crossover. Irving in part owes his phenomenal ball handling to a drill learned from his dad: dribbling a ball wrapped in a plastic bag. The plastic reduces bounce and feel, forcing the player to dial up focus and dribble harder. Look no further than an Irving fast break to the hoop for evidence. *WearTesters note: I just tried this, its hard. #8 – In an alternate universe, Irving would be a journalist. If he weren’t playing pro hoops, he would probably be a journalist. He still could be in the future. Dad sees him as a journalist, sports analyst or coach working with kids 20 years from now. #9 – He loves mac and cheese. His go-to comfort food is mac and cheese, a favorite of many that dates back to baked pasta dishes of 14th century France. #10 – Irving is the first player in 6 years to have a Nike signature shoe. Just a glimpse of Kyrie’s skating footage can be found on YouTube. What kind of plastic bag would you use for his dribbling drill? Something like one of those plastic bags you get at the grocery store? The kind that are now banned in certain Cities/ States that you’d get from the store. Gotta try the plastic bag thing! they should do a harden sig. and post an article like this. things you don’t know about the beard. he actually played defense but gave up a couple of times trying. Did you get the Kyrie 1s? How are they? 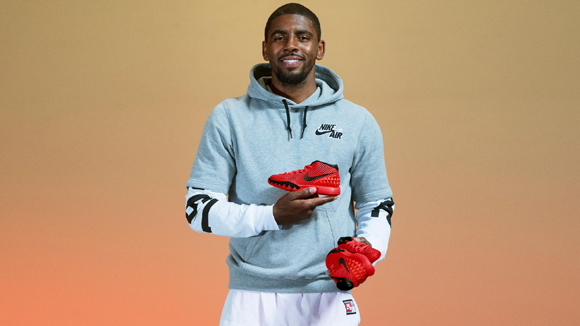 Does anybody know where the sweater Kyrie is wearing in the photo is available? I’ve been looking for a sweater like that for a while and can’t find it on the nike website. Numbers 1 and 2 make him very similar to Eiji Sawakita from Slam Dunk.